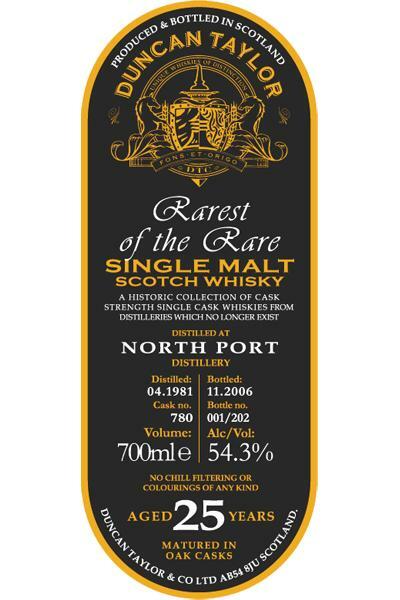 This is from the series Rarest of the Rare from Duncan Taylor. It is a historic collection of cask strength single cask whiskies from distilleries which no longer exist. It is from Cask number 780 and only 202 bottles were made. Oak! Loads of oak at first in the smell. Some oak spices, vanilla and caramel as well. Light white fruits and marzipan in the end. A lovely dark profile in the taste. Alcohol, tobacco and dried fruits. The oak is coming through nicely without being too dominant. Some spices arrives in the finish (and a little before that). Oak spices - cinnamon in particular! Just a wee sweetness compliments it all in the end. What a lovely expression of North Port. Makes you miss their presence in today’s market. Maybe the dark profile and the high strength is a bit much to some, but for me it was spot on! I will give this 91/100 (22/23/23/23).